I recently attended a conference for spa professionals and one big trend I noticed was a ton of LED light therapy machines. The funny thing is, light therapy has been around for quite some time and is apparently making a come back and with good reason. What does LED stand for + how does it work? LED stands for light emitting diode. Basically, LED is a light source that emits infrared light and heat at different wavelengths that penetrate into skin cells. They were made famous by NASA for plant growth experiments. They have been studied a lot, they are not dangerous and they contain no harmful UV rays. They are actually safe for the eyes, though many units come with goggles for the sake of brightness. For skin therapy, they are typically used via single light units, handheld wands or panels/masks that are pointed at the skin a few inches away. There are home and professional versions, and many different price points to fit everyone’s budget. I will note that the at-home versions are less potent than the pro versions but they are still very beneficial. The benefits are cumulative so it’s important to be consistent to reap all the benefits. I recommend around 5x a week. What are the benefits of the different colors? + Red reduces inflammation which is great for acne, sensitive skin and rosacea. It stimulates collagen production so it’s great for fine lines and wrinkles. It’s also wonderful for wound healing and blood circulation. + Cyan (light blue) calms and soothes irritated skin and helps to reduce the size of capillaries. + Purple increases cell regeneration and renewal and it good for fine lines and wrinkles. + Green is wonderful for hyperpigmentation from sun damage or old post inflammatory pigmentation left from acne. + Orange is good for inflammation and reducing redness associated with rosacea and sunburn and promotes brighter skin. There are so many options on the market and vary in price from $30 to thousands. These are my picks! This light therapy mask is a combination of blue and red light to help heal acne, reduce blackheads and the inflammation and redness associated with acne. The pen is really great too for people that have the occasional breakout for spot treatment. 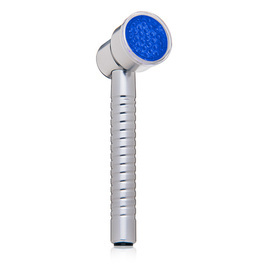 This handheld device is a combination of blue and red light to heal acne, reduce blackheads and calm redness. This is an anti-aging and wrinkle reducing red light therapy eye treatment made specifically to combat wrinkles around the eye area. This handheld light is a combination of red, dark red and amber lights for the ultimate in anti-aging, reduction of fine lines/wrinkles and collagen stimulation. Quasar Light Therapy devices are of professional strength and what many estheticians use in facial treatments. Best for acne and blackheads. Best for reducing wrinkles and fine lines.